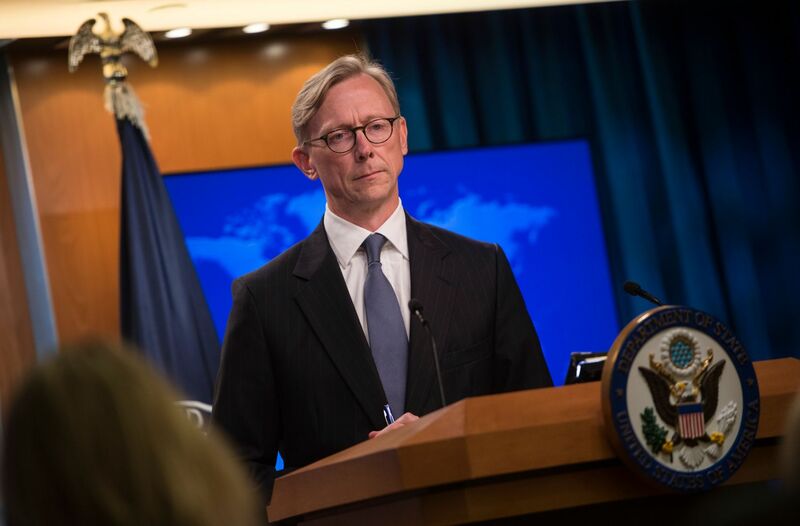 Brian Hook, the newly appointed head of the Iran Action Group, speaks about the “Iran Action Group” during a press briefing at the State Department in Washington, DC, August 16, 2018. Ignore Iran’s development and test of the ballistic missiles. Check. Allow Iran to continue funding terrorist groups such as Hezbollah. Check. Deliver planes loaded with cash to Iran in a swap for American hostages. Check. Allow Iran to funnel that cash to prop up the Assad regime in Syria. Check. Allow Iran to crack down on dissidents, oppress women and execute a record number of Iranians. Check. It’s an impressive accomplishment with the benefit of hindsight to see how little the U.S. and the rest of the world got for a flawed nuclear deal. The butcher’s bill was heavy with victims that included nearly half a million men, women and children killed in Syria and flooding Europe and the U.S. with over four million refugees. The response to this unprecedented escalation in violence and regional instability was deafening in its silence as the U.S. led by example and did nothing to counter the rise of Islamic extremism and terrorism unleashed by Iran’s proxy wars, including the creation of ISIS. Fortunately, President Donald Trump has re-oriented U.S. foreign policy and placed the Iranian regime front and center in terms of trying to find innovative ways to corral Iran’s extremist tendencies and chart a pathway towards democratic reforms for the long-suffering Iranian people. His first step was to fulfill a campaign promise and withdraw from the Iran nuclear deal. Then he moved swiftly to reimpose economic sanctions aimed at hurting industries controlled by and profiting the regime’s military and ruling elites. The Trump administration also announced the formation of an Iran working group within the State Department to help coordinate the government’s response to Iran and search for ways to help foster democratic reforms in the Islamic state. Brian Hook, the department’s current director of policy planning, will lead the team as the administration’s “special representative for Iran,” Secretary of State Mike Pompeo announced Thursday. “That is our strategy,” Hook said. “We have launched a campaign of maximum diplomatic pressure and diplomatic isolation” against Iran. Trump, he noted, “has also said he is prepared to talk” to Iranian leaders without preconditions, an initiative he said was on a “parallel track” to sanctions pressure, according to the Washington Post. Predictably the Iran lobby attacked the idea, but its effectiveness seems akin to the Little Dutch Boy with his finger in a dike being swamped with storm waters as the Trump administration moves aggressively on several fronts to pressure the mullahs in Tehran. “Not only is the Trump administration content to sabotage a successful nonproliferation agreement with Iran and collectively punish 80 million Iranians with harsh sanctions, the State Department’s new ‘Iran Action Group’ is nothing more than an attempt to bypass the State Department’s civil servant experts to implement Pompeo’s dangerous vision to destabilize Iran and close diplomatic off-ramps,” said Jamal Abdi, President of the National Iranian American Council. Abdi recites the same “boy who cried wolf” refrain claiming this is a lead up to war with Iran, but there is no evidence as President Trump has long been a critic of previous U.S. armed intervention, including criticizing the Iraq invasion while on the campaign trail; a fact Abdi neglects to mention. But while Abdi focuses on the falsehood that the U.S. is supposedly arming for war, the real issue which Abdi and the rest of the Iran lobby is terrified of is that the working group is really focused on finding ways to empower and support the Iranian people who are leading the push for democracy with massive waves of protests that have rattled the mullahs badly. The internal pressure mounting on the regime has led to in-fighting previously unheard of in the notoriously closed-knit ruling elites, including calls by Iranian lawmakers to launch impeachment proceedings against President Hassan Rouhani’s finance minister on Sunday in a move designed to provide a scapegoat as U.S. economic sanctions hammer the regime. A group of 33 MPs signed a motion accusing the minister, Masoud Karbasian, of being unable to manage the economy or form and implement policies, according to Reuters. That was enough votes to force Karbasian to come to parliament to answer questions on his record in the next 10 days. But that move may only be a band-aid as the real hammer – oil sanctions – loom in November forcing the Iranian regime to take the unusual step of publicly calling on OPEC to ensure that no other member state be allowed to take over its share of exports once sanctions are implemented. The move was in response to reports that Iran’s chief regional rival in Saudi Arabia was prepared to take over Iran’s share of oil exports once sanctions are implemented, but even that move may be unnecessary since the European Union is still struggling to figure out ways to guarantee Iranian oil exports and sidestep U.S. sanctions in transferring payments to Iran for its oil. The prospects look bleak as European companies fell like dominos in pulling out of deals with Iran in fear of U.S. sanctions that could cripple their operations elsewhere. The new U.S. action group has finally placed the Iranian regime in its cross hairs and the Iranian people finally have the powerful ally they have long needed and desired.